I love reading recipes. Especially when at the end, I think, I can do that. Then I do, and I either realize, it’s a whole lot harder than it sounds, or it was really simple and now I have another delicious dish to add to my repertoire. That’s what happened as I was perusing my latest issue of Cook’s Illustrated. 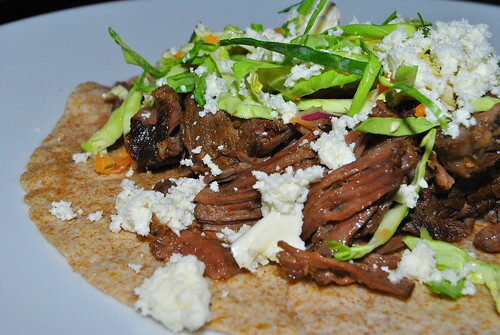 One of the recipes/articles was Taqueria Beef Tacos at Home by Andrew Janjigan. I was intrigued. The recipe seems preety straight forward with no special equipment or fancy kitchen acrobatics required. So, I gave it a try. Of course, with my own variations due to some equipment limitations (like no blender, so no sauce), and I subbed out brussel sprouts for cabbage in the Cabbage-Carrot Slaw recipe that was also part of the tacos. I also nixed the jalapeno and ancho chilies since I didn’t feel like tracking them down. Preheat the oven to 325 degF, with the racks adjusted so you can fit your dutch oven into it. 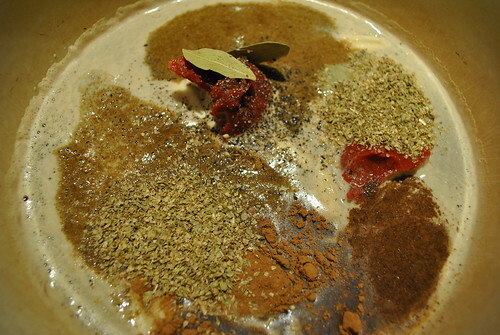 In your dutch oven, combine the beer, vinegar, garlic, tomato paste and all the herbs. Give it a good stir, then lay the onion slices on a single layer on the bottom of the pot. Place the beef on top of the onions in a single layer. Cover and put into the oven to cook for 2 1/2 to 3 hours. Until well browned and tender (shred it with a fork tender). 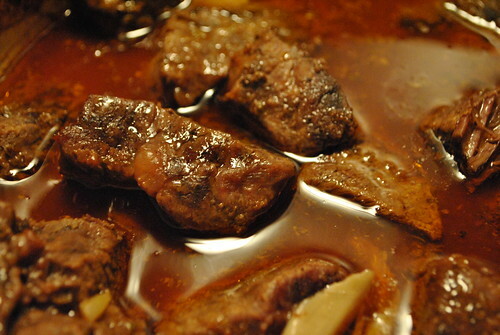 When done, remove from oven, and remove the beef chunks onto a plate and tent with some aluminum foil and let it rest. When it’s time to make tacos, use two forks and shred the beef into bite size pieces. I also made a Brussel Sprout Carrot Slaw to go with my mega tacos. While the beef was in the oven, whisk together the vinegar, water, sugar and salt in a large bowl until the sugar is dissolved. Add everything else, then toss to combine. Stick it in the fridge for at least an hour before eating. 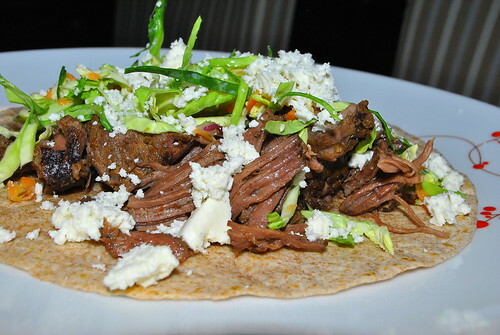 To assemble my mega tacos (mega because I could only find 8 inch round tortillas as opposed to 6 inch tortillas), I put a little shredded beef, some slaw, some queso fresco, and some mango salsa and went to town. It was super yummy. The beef wasn’t dry, and quite meaty in flavor. The slaw gave it a nice crunch and lightness. I really liked it. So much so, I ate it for dinner for the next three days. Reheating the beef in a skillet gently on a low flame. Then I still had a huge amount left, and really not wanting tacos anymore. So I made a quick chili by combining the rest of the beef with a can of diced tomatoes, the rest of the tomato paste, chili powder, and a little water to thin it out a touch. I also added the rest of some frozen kale I had to make it “healthier”. It was great as a quick chili. Still meaty, still good, and nice and hearty when I need dinner after a long work day. Another recipe to add to the mix. 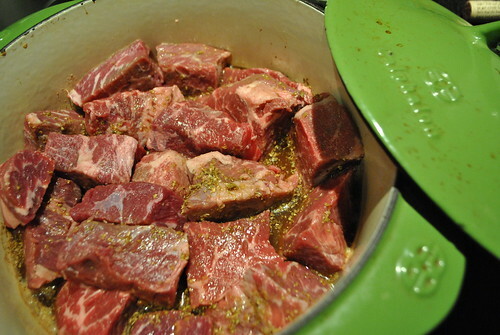 If I ever come across some cheap boneless short rib, I’ll know exactly what I can do with it! 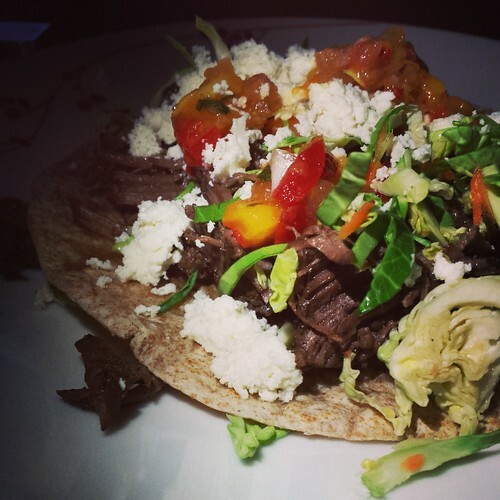 This entry was posted in Beer, Dinner, Uncategorized and tagged Beef, Beer, Braise, Brussel Sprouts, Carrots, Cook's Illustrated, Short Rib, Slaw, Tacos. Bookmark the permalink.